CHRIS MORELLI/THE EXPRESS Three of the participants in Victorian Christmas pose for a photo. 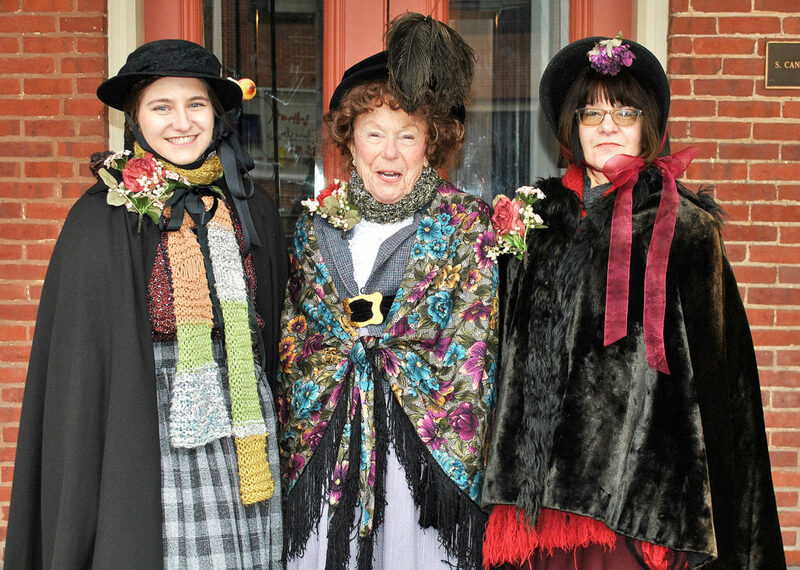 BELLEFONTE – Although temperatures dipped into the 20s, that didn’t stop hundreds of people from descending on downtown Bellefonte for the 37th annual Victorian Christmas Celebration. There was activity throughout Bellefonte all weekend. 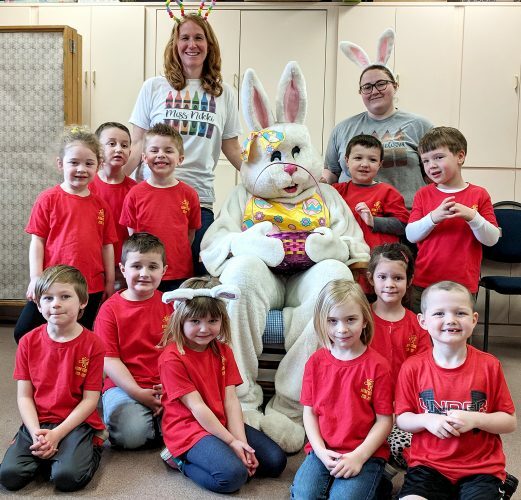 There were horse-drawn carriage rides throughout town, an arts and crafts show at the YMCA, food vendors, Dickens characters walking around, strolling entertainers, and, of course, Santa Claus. The Santa House had a line for much of the day. “It’s been busy since we opened,” the Big Guy said on Saturday afternoon. Inside the YMCA, the arts and crafts fair filled the gymnasium. There were candles, homemade perfumes, jewelry and Christmas ornaments. At the entrance, Scott’s Roasting and Snyder’s Concessions sold pork sandwiches and French fries, respectively. CHRIS MORELLI/THE EXPRESS Two girls place money into one of The Salvation Army’s red buckets. Outside the YMCA, the Salvation Army Kettle was busy. Linda Bathgate of Bellefonte was ringing away when the Decker family stopped by. 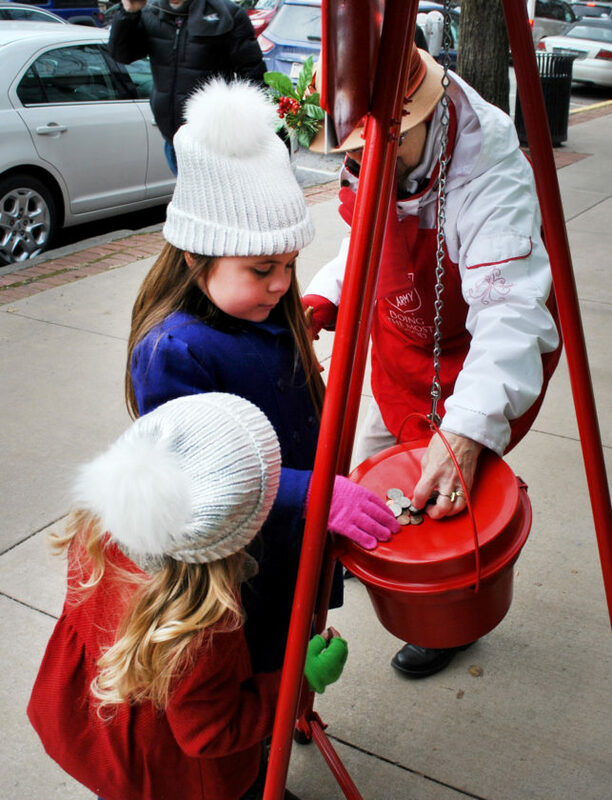 Lucy Decker, 6, and her sister, Harriet, 3, emptied plastic bags of change into the red kettle. Their father, Mark Decker, said his daughters had been doing a gratitude Advent calendar and saving coins to dump in the kettle. “It was my wife’s idea. Instead of having a piece of candy, we had the girls do something nice. Today, we had them gather up all the change they could find and give it to the Salvation Army,” Decker said. 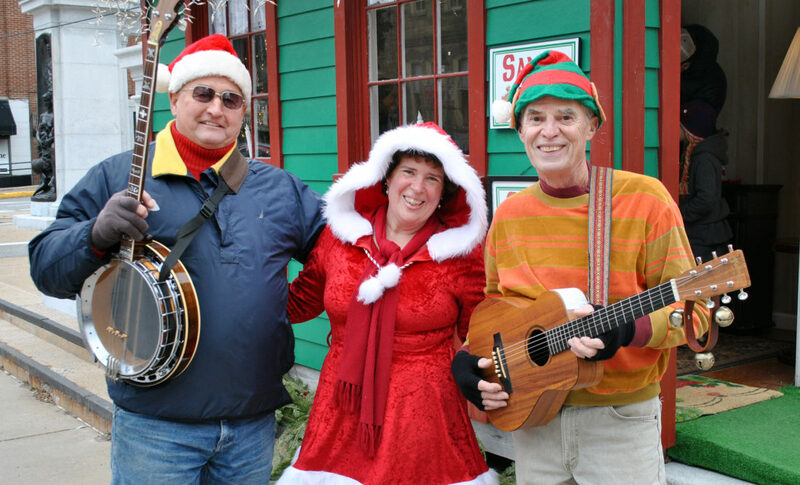 The family resides in Bellefonte and comes to Victorian Christmas every year, he said. CHRIS MORELLI/THE EXPRESS Three street performers, all dressed up for the weekend, pose for a photo between performing. “We really love it. It’s just wonderful,” he said. Over at the Brockerhoff House, Linda Hershey was taking reservations for the horse-drawn carriage rides. By mid-afternoon, all of the rides were booked for Saturday. Hershey was taking money and handing out tickets for the rides. Rather than turn families away, she started taking reservations for Sunday’s rides. 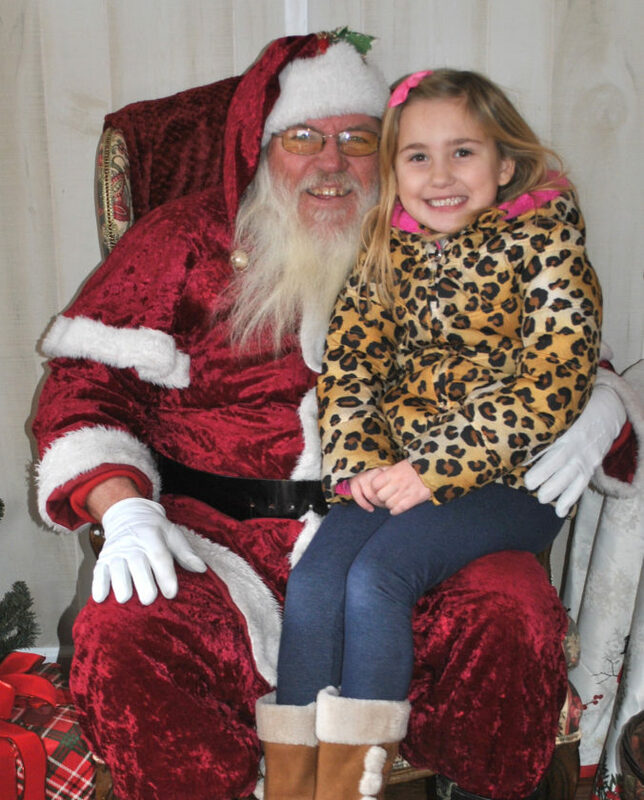 CHRIS MORELLI/THE EXPRESS Kennedy Calhoun was excited to tell Santa all of her Christmas wishes on Saturday. Hershey said over the course of 20 years, she has seen Victorian Christmas expand and grow. She loves everything about the weekend, she said. “They do a great job of dressing in the era and that type of thing. I like the quaintness of the town and that really helps. I think having enough activities for everyone just makes it a great weekend,” Hershey said. Later on Saturday afternoon, the Bellefonte Riverwalk was lit up for a Winter Market under the lights. There were food trucks, vendors peddling Christmas gifts as well as some adult beverages from Bellefonte’s own Big Spring Spirits. 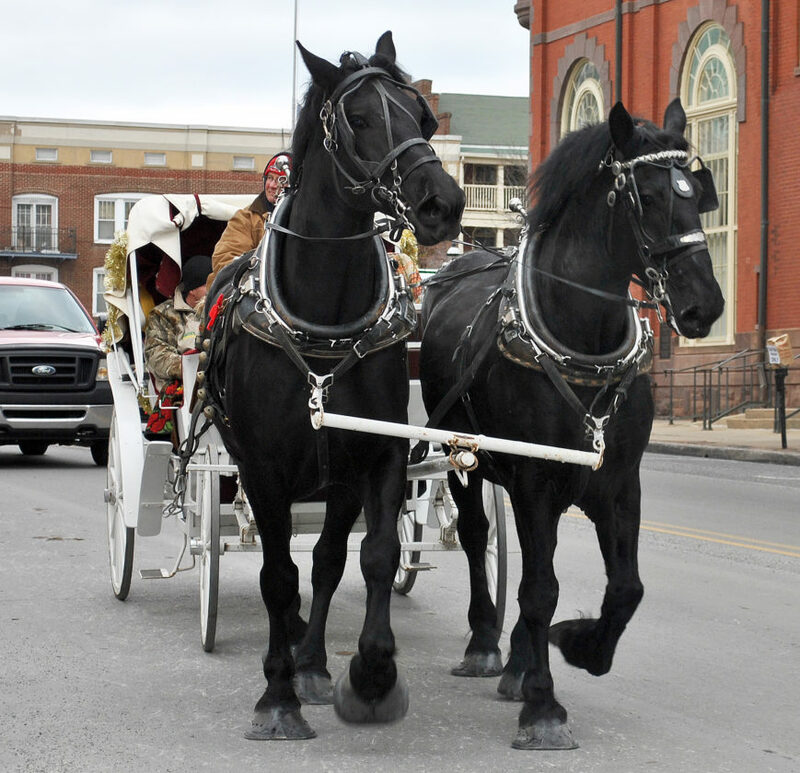 CHRIS MORELLI/THE EXPRESS Carriage rides are a very popular attraction during Bellefonte’s Victorian Christmas.